The planning and execution of a construction project is a complex process with a number of moving part and pieces. In many cases it involves assembling a number of individual components in order to create one harmoniously connected structure or facility. From a human capital perspective a building project involves project participants from the owners group, architects, engineers, consultants, construction managers, builders, subcontractors, material suppliers, and in some cases members of the post construction operations and maintenance staff. 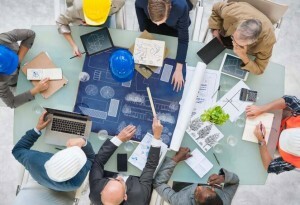 As projects become more complex, with tighter timelines and more sophisticated components collaboration among project team members will be a necessity for successful project outcomes. Collaboration promotes a sense of team and partnership among all project stakeholders which links everyone to the mutually beneficial goal of on time and on budget successful project completion. Let’s briefly examine each of these attributes in order to correlate how they positively affect construction project outcomes. When the design group and the construction group work together as one team from early project inception the collective intelligence of the group is harnessed to create valuable perspectives and insights related to the final product. Multiple perspectives lead to a greater selection of alternatives that can be utilized to successfully deliver the project. Collaboration amongst project team members and stakeholders allows for value engineering conversations to take place in real time. Collaboration allows for changes to project scope and schedule to be identified early in the project lifecycle. Early scope/schedule issue identification creates an opportunity for project team members to offer solutions that align with overall goals related to project cost and milestone completion timelines. Projects delivered in a collaborative manner create a team dynamic. This eliminates the historically ambivalent relationship between designer and constructor by putting them both together at the table as teammates. This allows both entities to execute their project responsibilities with a focus on creating win-win solutions that mitigate non-productive interactions looking for fault or blame when things don’t go right. The design team isn’t left to defend every omission or interpretation on the drawings and the contractor doesn’t have to worry that they will be stuck bearing the brunt of any scope gap or specification ambiguity. When people work together they get a better feel for one another. Collaborative construction delivery is no different. In a collaborative environment project team members are engaged with one another in the planning and design phase. This provides the opportunity for everyone to learn each other while learning the project. Design intent is understood more intimately by construction team members and the means for quality assurance can be developed and vetted before construction starts. In addition project design team members can provide input related to technical specifications and quality assurance before work begins to be put in place. Collaboration helps to foster and facilitate an exceptional customer experience, by greatly reducing dispute resolution. Utilizing a collaborative delivery minimizes the amount of time the owner must dedicate to being a referee between two or three warring factions. This leaves the owner time to put more energy into focusing on project execution and completion. Collaboration allows for the project team to focus on solutions that benefit the project instead of individual interests. This creates an experience that leads the owner to reflect positively on the competence and professionalism of the team, in addition to the innovation and craftsmanship associated with the execution of a successful project.